Steve Nobel interviews Renee McGregor, author of Training Food. 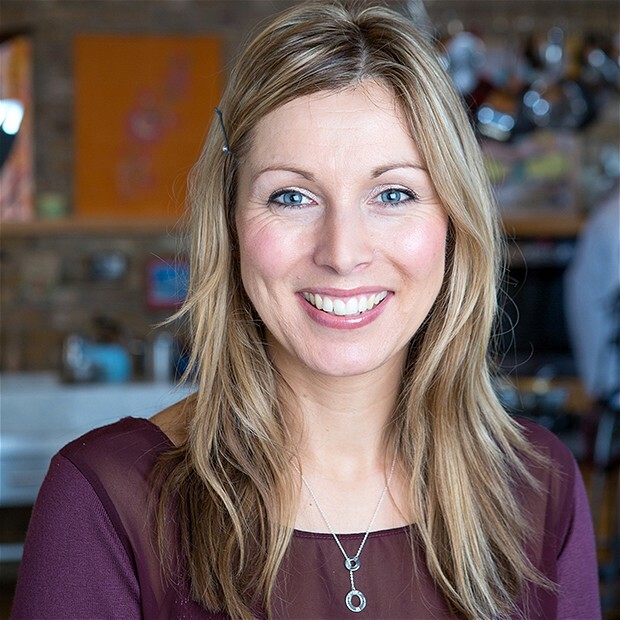 Renee McGregor Bsc(hons) RD PGCERT(sportsnutr) is a registered dietitian and is one of the UK’s top sports nutritionists who has over 14 years experience advising athletes and their coaches at all levels. Renee is a regular contributor to BBC Food, Cycling Plus, Trail Running Magazine, Runner’s world Magazines and she is the author of Training Food. This book is written to help you understand the science of sports nutrition through practical advice and is packed with over 100 delicious and easy to make recipes to enhance your physical performance. Nutrition requirements for different types of sport. Organic versus processed food during training. Micronutrients and supplements during training. Vegetarian versus meat eating during training. Combining of carbs, protein, and fats. Getting the right kind of hydration for our chosen sport. Wild watercress can be seen growing in summer streams, although the vivid green bunches that arrive on the greengrocers’ shelves have been cultivated in special beds with piped running water and are available all year round. 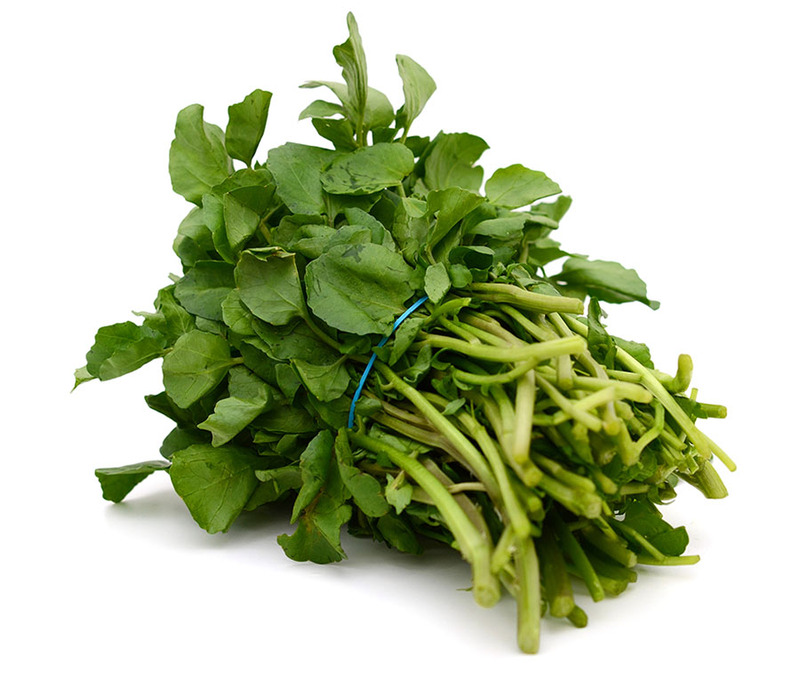 The robust, peppery flavour of raw watercress is delicious in salads, or it may be shredded and added to cooked dishes at the last minute. Some people, however, find watercress too powerful on its own, and prefer it combined with blander ingredients or used more as a flavouring. The shredded leaves are excellent stirred into creamy mashed potato just before serving, or combined with milder lettuce leaves in a salad, in a similar manner to fresh herbs. Spread savoury scones with thick cream cheese and top with a sprig of watercress, or shred a handful of leaves and sprinkle over an omelette while it cooks. Choose watercress with large dark leaves and avoid any that is withered, limp or slimy. If a recipe requires only the leaves, simply pluck them off the stems. For salads, part of the stem is often trimmed off, leaving the more tender upper part and juicy leaves. Ingredients: 25g/1oz butter; 1 onion, chopped; 225g/8oz potatoes, chopped; 750ml/26fl oz/3 cups vegetable; stock; 175g/6oz watercress; 250ml/9fl oz/1 cup milk; 4 tbsp single cream; salt and freshly ground black pepper. Melt the butter in a pan, then add the onion and fry gently for about 5 minutes until soft. Add the potatoes, pour over the stock and leave to simmer for about 15 minutes until the potatoes are tender. Meanwhile, remove the green leaves from the watercress and roughly chop the stalks. Add the stalks to the pan and cook for about 2 minutes, then stir in the leaves, reserving a few to garnish, and cook for about 1 minute more. Pour the contents of the pan into a food processor or blender and process until smooth. Return to the pan, stir in the milk and bring to simmering point. Remove from the heat, stir in the cream and season to taste with salt and pepper. Serve immediately, garnished with the reserved watercress leaves. 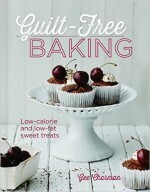 These recipes has been taken from Guilt-Free Baking by Gee Charman. Well, not if they are traditional tarts and pies. The battle over pastry has always been well fought among dieters. Pastry is full of fat and has barely an iota of goodness in it. The problem is that it tastes great and some of our best-known desserts and baked treats are surrounded by it. Apple pie was a signature dish of my grandmother and her pastry was so short, it melted in your mouth. But when you watched her make it you could see why – butter, and lots of it. My solution is to use ricotta cheese instead in pastry for pies and tarts, which reduces the fat and gives beautifully crispy results. For the low-fat shortcrust pastry: low-calorie cooking oil spray, for greasing; 150g/5½oz/1¼ cups plain flour, plus extra for dusting; 30g/1oz butter, chilled; 1 tbsp caster sugar; 3 tbsp ricotta cheese; 1 egg white. For the cherry filling & almond topping: 1 tbsp cherry or raspberry jam; 200g/7oz/heaped 1½ cups pitted cherries, halved; 30g/1oz/¼ cup ground almonds; 50g/1¾oz/⅓ cup fine polenta; 2 tbsp plain flour; 50g/1¾oz/scant ¼ cup caster sugar; 2 eggs; 150g/5½oz/scant ⅔ cup fat-free natural yogurt; 1 tsp almond extract. I can hear the people of Bakewell shouting from here. I know it’s not a classic Bakewell tart but when you guys come up with such a great recipe, those of us watching the calories still want to enjoy it. It works equally well with raspberries, plum halves, blueberries or blackberries. Preheat the oven to 180°C/350°F/Gas 4 and lightly oil a 20cm/8in deep, fluted non-stick tart tin with a little low-calorie cooking oil spray. To make the pastry, put the flour in a large bowl, then rub in the butter, using your fingertips, until the mixture resembles coarse breadcrumbs. Stir in the sugar, then use a fork to mix in the ricotta and gently blend to a smooth dough, adding up to 1 tablespoon water, if necessary, a drop at a time, to bind the ingredients together. Cover with cling film and chill in the fridge for 10 minutes. Turn the dough out onto a lightly floured surface and roll out to 3mm/⅛in thick. Use to line the base and sides of the prepared tin. Carefully push the pastry into the flutes of the tin, leaving any overhanging pastry attached. Line the pastry with baking paper and cover with baking beans. Bake for 12 minutes, then remove the paper and beans. Brush the base and sides of the pastry with a little egg white, then bake for a further 10 minutes until golden. Remove from the oven and use a serrated knife to trim off any excess pastry. and almond extract. Add the wet ingredients to the dry ingredients and mix together well. Spoon evenly over the cherries. Bake for 20 minutes until just set with a slight wobble in the centre. Cool in the tin. Meanwhile, put the icing sugar in a small bowl and add about 1 teaspoon water, a drop at a time, stirring vigorously until you have a thick paste that just runs off a spoon. 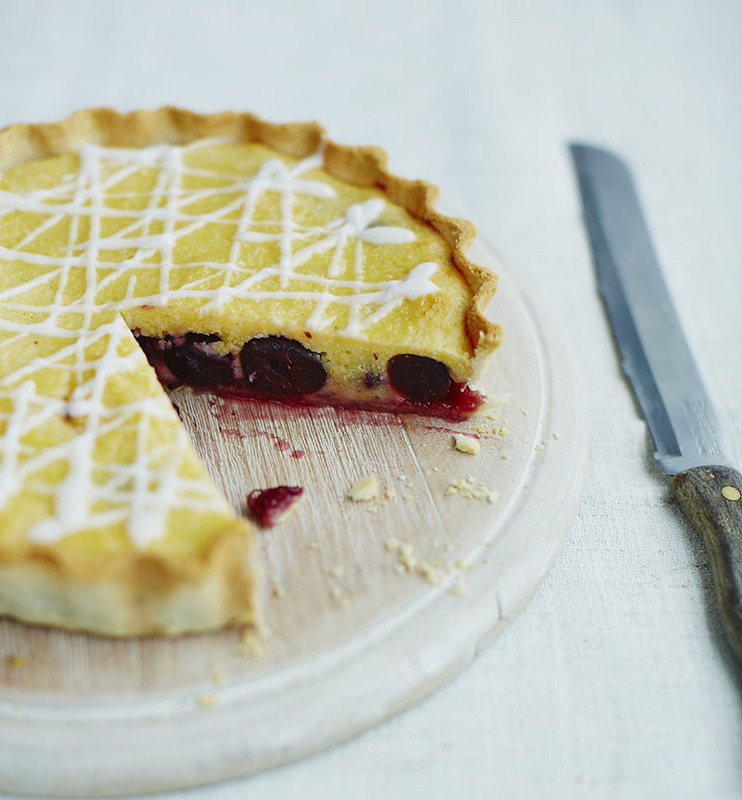 Drizzle in lines across the tart, then leave to set for 5 minutes before serving. For the ricotta pastry: 150g/5½oz/1¼ cups plain flour, plus extra for dusting; 30g/1oz butter; 1 tbsp caster sugar; 3 tbsp ricotta cheese; grated zest of 1 orange. I can generally eat a dish in a restaurant or café and get home and recreate it – it’s habit and a skill most chefs pick up. But I just cannot make an apple pie like my grandmother. It’s not human nature to admit our shortcomings but this is mine – I can’t do it. So I have given up and I now make other pies instead. This one is my favourite and – though I say so myself – it is blinking good! To make the pastry, put the flour in a large bowl, then rub in the butter, using your fingertips, until the mixture resembles coarse breadcrumbs. Stir in the sugar, then use a fork to break the ricotta into the mix. Add the orange zest, then gradually add about 1 tablespoon water, a drop at a time, and mix to a dough. Add the water very gradually as all flours absorb different amounts of water. Roll the pastry into a ball and flatten to a patty, then wrap in cling film and chill in the fridge for 30 minutes. While the pastry is chilling, peel, core and slice the pears. Put them in a bowl with the blackberries. Preheat the oven to 180°C/350°F/Gas 4 and line a baking tray with baking paper. Roll out the pastry on a lightly floured surface to a 30cm/12in circle and put it on the prepared baking tray. Scatter the base of the pastry with the semolina – this will help absorb any juices and prevent the pastry from having a soggy base. 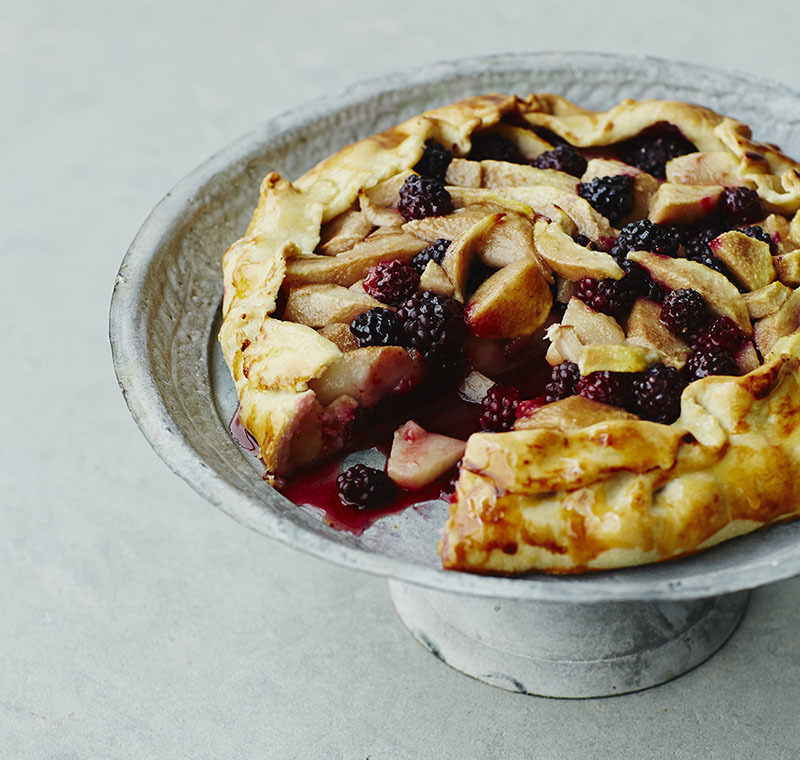 Pile the fruit in the centre of the pastry and bring the sides of the pastry up around the fruit. This doesn’t have to be neat – you want it to look rustic. If the pastry does crack, just patch it up. Brush the outside of the pastry with a little beaten egg. Bake for 30 minutes until the fruit has softened but has not gone mushy and the pastry is cooked and golden. Transfer to a wire rack to cool. Meanwhile, put the honey and orange juice in a small saucepan and bring to the boil over a medium heat. Turn the heat down to low and simmer for about 2 minutes until syrupy. Brush this over the cooked pie before serving. 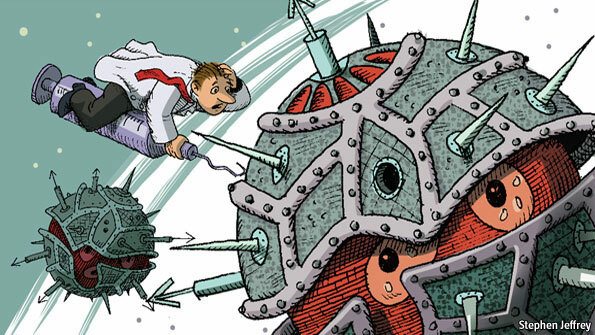 This article has been cross-posted from Octopus Alchemy. It’s easy to misinterpret fermentation as some unremarkable practice, carried out by fuzzy old ladies in farmhouse kitchens in the back of beyond – and of course it is, but that’s not all of it. In fact, the potency of those few fizzing mason jars and cobwebbed crocks hanging out in your nan’s cupboard goes far beyond taste and an old wives remedy: they symbolise a kind of politics from below; a lively critique of the way we live our lives and how we understand our bodies and their place in nature. Those humble few dusty mason jars and their contents have effects far beyond their cupboard and their consumers. 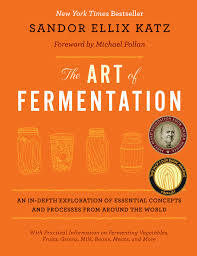 It’s no secret that fermentation is making a comeback in the West or that knowledge(s) about the importance of the microbiome are resurfacing again (contrary to the arrogance and imperialism of biomedicine, this is not a new discovery or even particular to the West). Katz’s revivalist efforts are now complimented by a landslide of interest in the techniques of wild fermentation, of culturing and preserving. 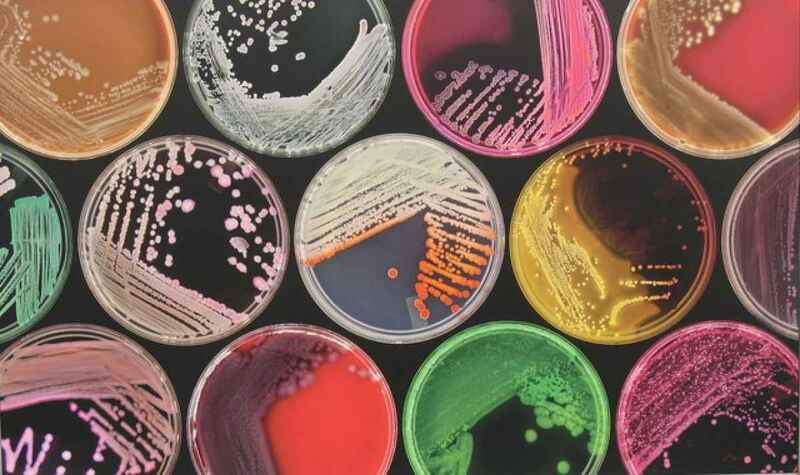 Every other week, peculiar and inventive little projects crop up in urban centres and beyond, preaching the lacto-gospel: fermentation on wheels, fermentation installations, fermentation festivals, blogs, podcasts and potlucks. In my home town of Brighton, fermented products now appear on swanky restaurant menu’s, with gourmet chef’s the world over crafting taste-experiences from this age old tradition. Sourdough bread, a novelty only years ago in the face of its cheap, white and easily processed rival, is (for the reasonably well heeled) becoming a staple once again. 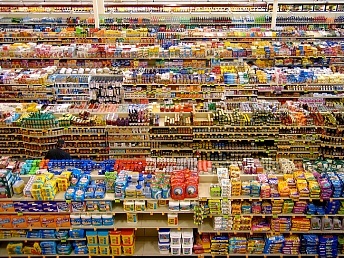 An ‘archaic revival’ in food is occurring; less of us now blink uncritically at the waves of corporate propaganda of ‘tasty’ and ‘convenient’ food. 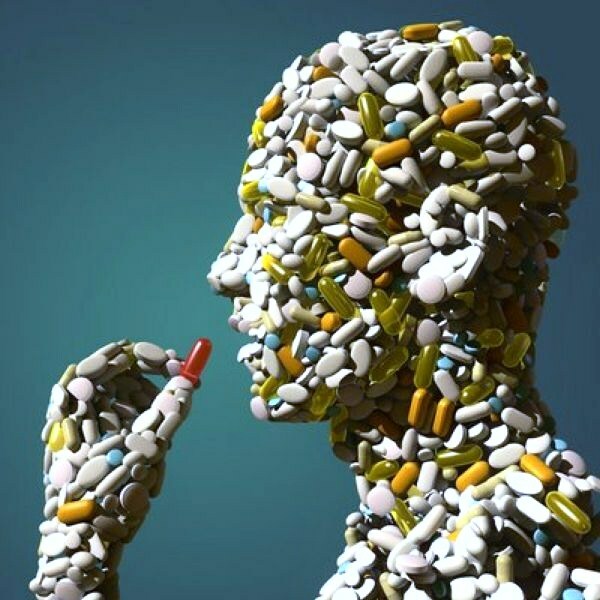 A generation of medical refugees, sick and fatigued by denatured and contaminated tucker and the biased and mechanical prescriptions of their biomedical Doctor’s, are reaching into the past to reclaim life affirming knowledge and skills. Fermentation is one of those skills, with each dry-salt or brine having a cascade of effects beyond its container – they are ‘vessels of dissent’, the web of relations and effects that echo from them extending into cultural, environmental and political realms. Away from the proliferation of drug-resistant pathogens, no longer kept in check via the natural competitive environment of healthy microbial ecologies, there is an even more sinister and pernicious fallout of this folly. The biodiversity and integrity of our internal microbiome (our resident ecologies of bacteria and microbes which ‘interact to form complex webs of mutual support’ and which promote optimum metabolic, immune and cognitive function) suffers irrevocably, with the consequences of this destabilisation only now becoming apparent. 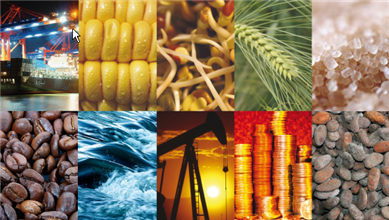 As Martin Blaser describes in his book “Missing Microbes’, the disappearance or extinction of a ‘keystone species’ of bacteria in the human microbiome means the overall ‘ecology suffers and can even collapse’. So What is a ‘Part-Time Vegetarian’, I Hear You Ask? 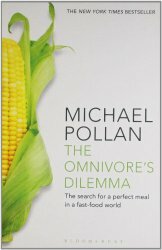 For me, there has been an exciting shift in enthusiasm for meat-free cooking over the last few years. 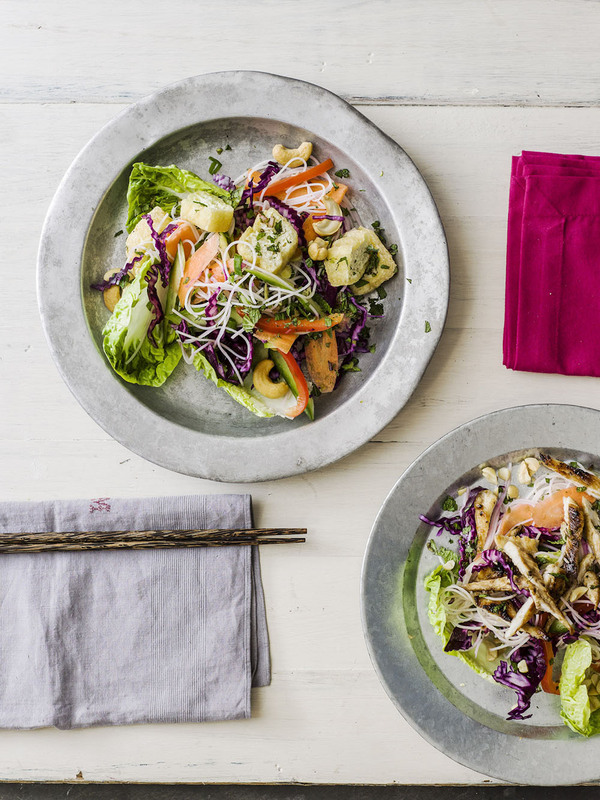 There’s now a significant number of us who choose to eat a predominantly plant-based diet, so the recipes in my new book have been created to satisfy this growing trend for part-time vegetarianism. Yet, unlike other books on the market it shows how some of the recipes can be adapted to include meat and fish, if you like. 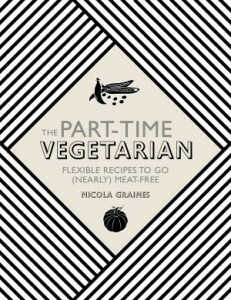 So the Part-time Vegetarian is a book for those who love vegetarian food, but who may not wish to commit to a fully meat-free diet and are looking for adaptable recipes. It’s also a way I like to eat – so my meals are principally plant-based, but I occasionally include meat and fish in my diet, although the ratio on my plate is always biased towards plant-based ingredients. The beauty of part-time vegetarianism, or flexitarianism as it is often called, is that there are no hard and fast rules. It’s a way of eating that suits everyone and can be as flexible and variable as you like. 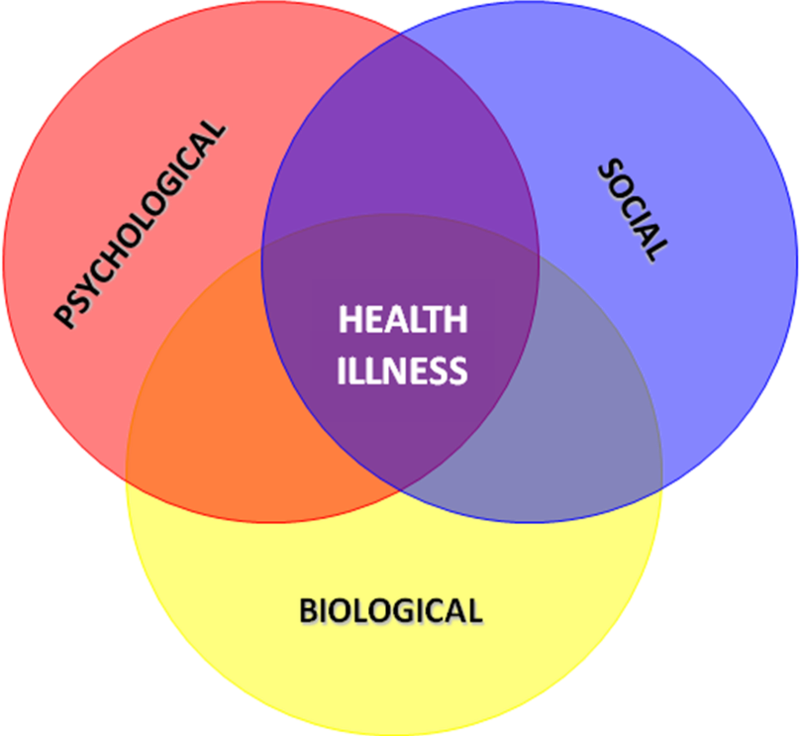 It also can vary from day-to-day, week-to-week depending on personal choice and circumstances. Ideally, the only criteria is that plant-based foods form the foundation of whatever meal you’re eating. The 120 vegetarian recipes in the book are also for those who have a vegetarian in the family and want fresh ideas, but are maybe also looking for recipes that can be easily adapted to suit all dietary preferences at home without having to cook two meals. 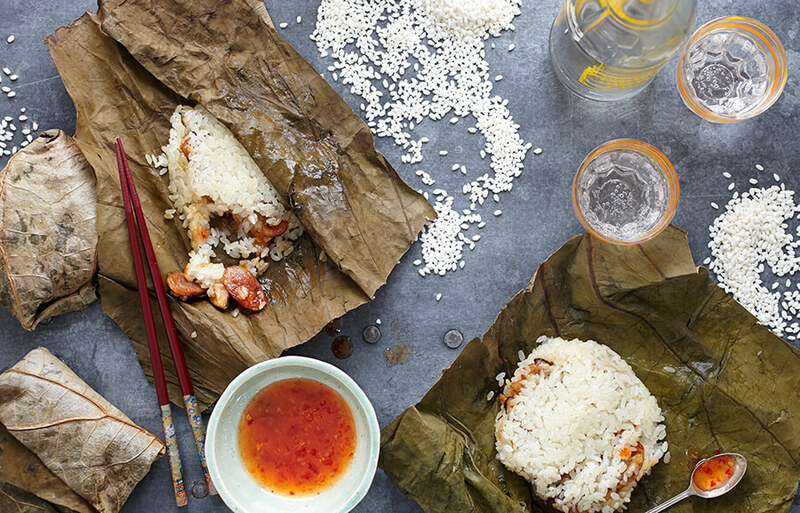 Likewise, there are recipes for special occasions or dinner-parties when there’s a vegetarian guest and the host is looking for a meal that will satisfy all tastes. 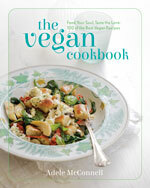 So most importantly, the book appreciates and celebrates the diversity of a flexitarian way of eating. This recipe for Vietnamese Crispy Tofu and Cashew Salad makes a great weekday summer meal but if you choose it can be adapted to include chicken and peanuts instead. opposite, if you are serving to non-vegetarians. the noodles and toss until combined. sunflower oil, turning occasionally, until golden and crisp. and crisp tofu before serving. https://nourishbooks.com/wp-content/uploads/2015/07/feat-image.jpg 835 834 Nourish https://nourishbooks.com/wp-content/uploads/2018/04/NourishLogo340x156-300x138-300x138.png Nourish2015-07-15 11:04:282015-10-02 10:27:57So What is a 'Part-Time Vegetarian', I Hear You Ask? 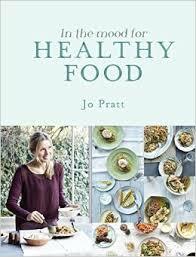 Jo Pratt is an acclaimed food stylist, writer and presenter. She has written for Elle, Weekend, Sainsbury’s Magazine, Olive, BBC Good Food and Glamour, for which she was Food Editor, as well as the BBC Food, Good Food Channel and Good To Know websites. She regularly appears on UK TV, including Saturday Kitchen and Daily Cooks Challenge, and works with many food brands. This book is for anyone and everyone who enjoys eating good food and wants to feel great once they’ve eaten it. There’s no eliminating, calorie counting or detoxing. They don’t have to be a fantastic cook or have lots of time on their hands, in fact it’s ideal for those with busy lifestyles (most of us then!) that need ideas and inspiration handed to them on a plate (so to speak). 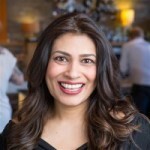 My aim is to inspire and increase the readers repertoire of healthy good-for-you recipes they can turn to, not only when they are in the mood for healthy food but anytime of the week. If the mood to eat healthily takes over, no matter what the reason or occasion, then you can find well-balanced recipes to cook that are packed with fresh, nutritious ingredients, from breakfasts and brunch dishes, light lunches and sumptuous salads, main meals, desserts and baking goodies. All recipes use easily obtainable, everyday ingredients that won’t break the bank or take you hours to locate, simple cooking methods and great looking results. 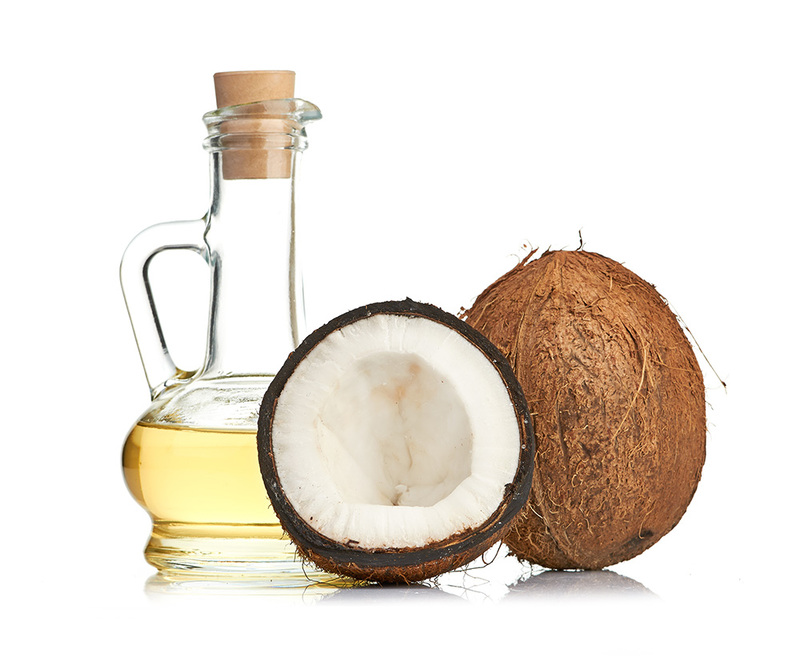 Where possible I have substituted less healthy ingredients for more healthy ones such as butter for oils, increasing veggies in a dish or bulking a dish out with wholegrains, and healthier cooking methods such as baking, steaming or poaching. To me writing goes hand in hand with developing recipes. I wanted to share my thoughts and ideas with people so started to put pen to paper every time I was cooking. I also sort of fell into it from all of the work I was doing with some big named chefs. They would often need restaurant recipes scaling down to work for people to cook at home. Then I was asked to do some ghost writing so I was getting experience along the way. My first break into writing my own recipes being published was when ELLE magazine approached me to regularly write recipes for different occasions and scenarios (i.e girls night in, pre partying food etc). I jumped at the chance and this then led on to an idea for my first cookbook …In the Mood for Food. When did your passion for cooking begin? As a child I always loved cooking, possibly due to the fact that both grandma’s and my Mum were very keen and adventurous cooks. I would enjoy helping in the kitchen and they would always encourage me to get involved. I saw my primary school cook not so long ago who reminded me that I used to ask her for recipes after lunchtime. I also used to pretend to be Delia Smith on tv as a child, so I clearly had a passion from a young age. I decided to do a degree in Home Economics to turn my passion into a career. I knew there were many avenues when it came to working in the food industry. Can you tell a bit about your experience with The Gorgeous Kitchen? The Gorgeous Kitchen is a really exciting project for me. It’s a contemporary restaurant specialising in beautiful global cuisine at Heathrow’s Terminal 2: The Queens Terminal. I have spend plenty of time in the past working for restaurant chefs and of course eating in many restaurants but this time round I’ve collaborated with three other female chefs, Sophie Michell, Gee Charman and Caroline Mili Artiss, to launch The Gorgeous Kitchen. We create the menu’s and train our team of fantastic chefs to recreate them on a daily basis. We opened just over a year ago and it’s a wonderful place to go for delicious food and drink, to relax and enjoy the beautiful surroundings before you fly. 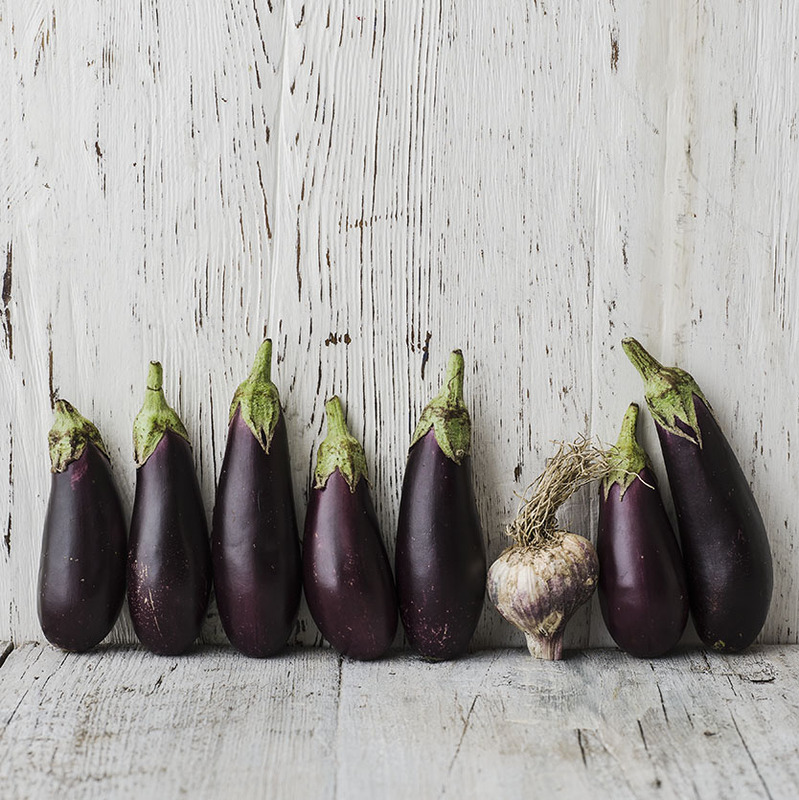 What was the biggest challenge in writing In the mood for healthy food? Not eating everything whist I was testing and creating the recipes. I couldn’t write a healthy cookbook and go up a couple of dress sizes in the process really could I?! I’d obviously try everything but my friends and neighbours are always happy when I am writing a book as they get to sample plenty as well. What was the first dish that you mastered? I remember when I was doing Food and Nutrition as a GCSE I made hot water crust pastry, which can be quite difficult to get perfect. I used it to make a classic Pork Pie. I’m from Melton Mowbray originally, which is famous for Pork Pies so it had to be the first dish to master really! Can you tell us 3 kitchen hacks for the hot summer days? Chilled flavoured water. It’s simple but very tasty and refreshing. Rather than just a glass of plain cold water, infuse a jug of water with pieces of ginger (handy to use up those tiny knobbly bits), slices of lemon, lime, lemon, orange, sliced apple or mint. Use a single ingredient or combine a few. The longer it infuses throughout the day better it tastes. Just keep topped up and chilling in the fridge. Chilled Soups. I’m a massive fan of gazpacho soup but many soups can be served chilled such as pea, red pepper or tomato. Serve with a couple of ice cubes floating on top to keep it nice and cold while you eat it. Avoid using your oven and hob too much as it will heat up your kitchen even more. If you have to do any baking try and do it first thing before your kitchen heats up throughout the day. Make the most of salads for lunch and dinner. 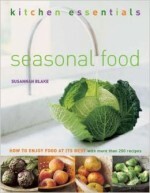 I’ve plenty of great salad ideas in my book, which wont get you hot and bothered on hot summer days. 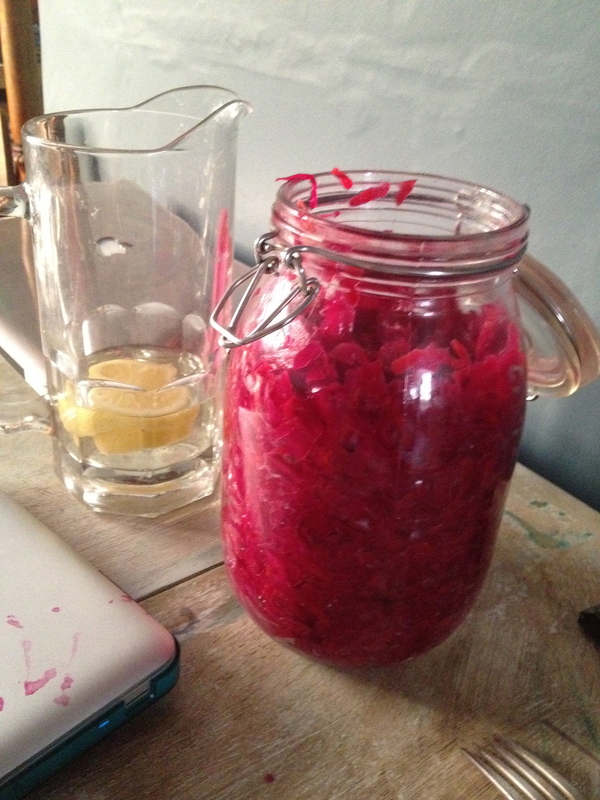 Traditionally a way of preserving vegetables to extend their shelf life as well as add flavour before the days of refrigeration, most cultures have their own version of pickled and fermented foods. What’s most interesting is that they are currently experiencing a revival in popularity, partly due to a renaissance in the back-to-basics approach in the kitchen but also because of their numerous health benefits, particularly supporting the immune system and aiding digestion. 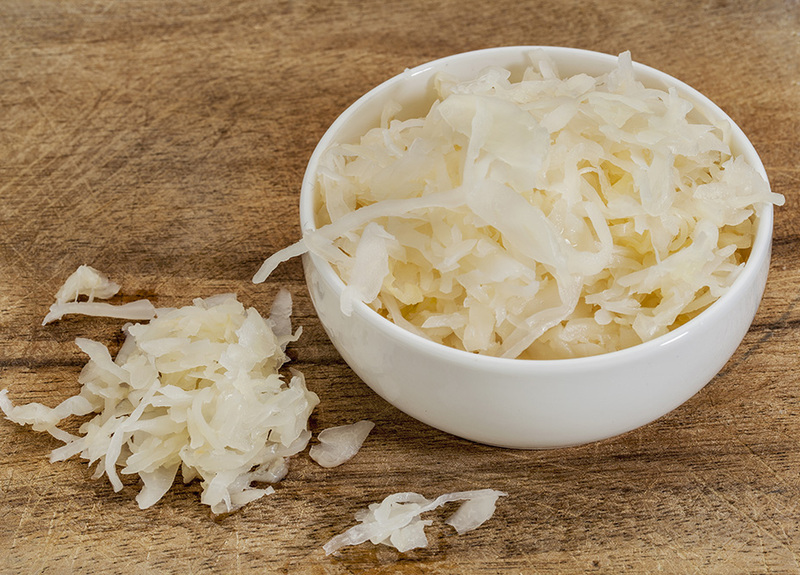 Fermented foods such as the Wild Sauerkraut, below, are made by adding salt to vegetables to stop them going off, while leaving them at room temperature to allow the natural bacteria and wild yeasts found in the environment and the cabbage leaves to preserve them. 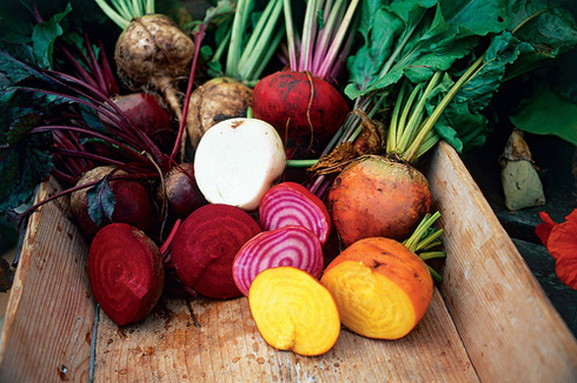 This esults in the vegetables developing a softer texture and a mildly acidic flavour. Pickles on the other hand rely on a combination of salt and vinegar as a preservative and tend to have a more piquant flavour. The technique for making both pickles and ferments is quite straightforward, but the end result requires a certain amount of patience as it can take weeks before they are ready to eat. Bearing this in mind, here are a few speedy ‘cheats’ versions, when time won’t wait. This basic recipe for sauerkraut can easily be adapted with the addition of spices, such as fennel seeds, caraway seeds, chilli and ginger, or by adding other vegetables, including kohlrabi, radish or kale. Put 750g/1lb 10oz shredded green cabbage, 2 grated carrots and 2 grated turnips in a large mixing bowl. Stir in 4 tsp fine sea salt with 5 crushed peppercorns and 2 tsp crushed coriander seeds. With clean hands, turn and lightly squeeze the vegetables for 5 minutes until they start to soften and release their liquid. Leave to stand for 10 minutes. Spoon into a sterilized glass mason or kilner jar, pressing the vegetables down firmly with the end of a rolling pin as you go to make sure they are tightly packed and until the level of the squeezed liquid is above the vegetables. Put a glass or smaller jar, inside the mason jar and weight it down to keep the vegetables submerged. Cover with a clean dish towel and secure with a rubber band to let the sauerkraut breathe. Leave at room temperature for 5–14 days, checking daily to make sure the vegetables are submerged, pushing them down if needed and removing any scum that forms on the top. Taste and when happy with the flavour, secure the lid and transfer to the refrigerator. It will keep for up to 6 months chilled. For a speedy version of kimchi, the famous and increasingly popular Korean fermented pickle, mix together a thinly sliced 2.5cm/1 in piece of fresh root ginger, 1 shredded carrot, 1 handful of shredded Chinese leaves, 2 shredded spring onions/scallions, 1 diced red chilli and 2 tbsp toasted sesame seeds with 4 tbsp rice vinegar, 4 tsp caster/granulated sugar and ½ tsp salt. Stir well and leave at room temperature for 30 minutes to allow the flavours to combine and develop. 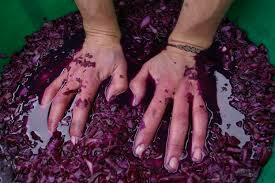 Transfer to a bowl to serve straightaway or to an airtight container and store in the refrigerator for up to 1 week. artificial pink. Mix together 4 tbsp rice vinegar and 2 tbsp caster/granulated sugar in a shallow bowl until the sugar dissolves. Add a 5cm/2in piece of fresh root ginger, peeled and cut into paper-thin slices, and turn until coated. Leave the ginger for about 30 minutes to steep, or until softened. The ginger is ready to eat but can be kept in an airtight container in the refrigerator for up to 2 weeks. Usually preserved lemons can take weeks to ferment, but this quick and easy version makes a surprisingly good alternative to the real thing. Simply, pare the zest of 2 large lemons into strips using a vegetable peeler and put them in a small pan. Squeeze in the juice of 2 large lemons and stir in ½ tsp sea salt. Set the pan over a low heat and simmer for 8– 10 minutes, or until the skin is very tender and has darkened slightly in colour. Transfer to a bowl to serve straightaway or spoon into an airtight container and store in the refrigerator for up to 1 week.